One of the big production bottlenecks for many shops is the time it takes to set up the machine for the job. While set-up is a necessary action for any job, there are some things one can do to reduce the amount of time it takes, and thus get more jobs done in less time, and cut delivery times. If your machine is not cutting parts right now, you are not making money right now! How much time is spent on set-up time in your shop? 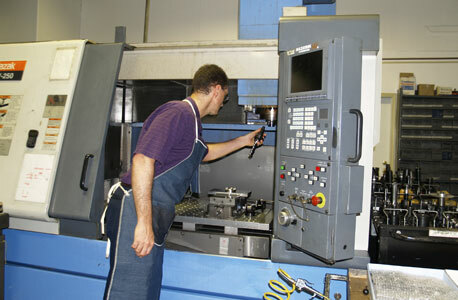 For example, I went and looked at a shop to review this specific point, and we found they were typically spending from 4 hours to 1.5 days to set up a job – and with short-run jobs that then only took a few hours to run the parts, you can see how much saving set-up time would multiply into significant improvements in number of parts cut and thus more profitability! One of the big time-absorbing tasks is setting up the tools for the job. In many cases, there are a certain set of tools that could be used on many jobs you run. By using the same group of standard tools, you can leave them in the machine from job to job and thus save the time of setting up those tools. Sure, each job might also need tools that are not in the standard group, but every tool you don’t have to set up (because it is left set up from job to job) saves you time. How many tools could you standardize on and thus save time in this manner? At first one might think this does not work because the ideal tool for one job is rarely the same as the ideal tool for another job. 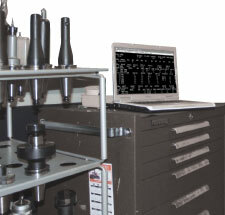 However, in many cases you could use a similar tool even if not perfectly ideal -- the real question to calculate profitability is how much machining time will you save by switching out tools versus the cost of setting up the tools. In many cases, especially for short-runs, the savings by not spending the set-up time far outweighs the number of seconds of machine-time saved by using a slightly more optimum tool. Make a simple list of the tools you know could be used on many jobs that come through your shop. For typical milling, this could include for example a ¼- and ½-inch end-mill, a certain spot-drill, certain taps and corresponding tap-drills, and maybe a few drills that are used on a lot of parts. Now type that list up with an exact specification – is it carbide or HSS? Is it 2-flute or 4? Is it stubby length or long? etc. Now assign each of those standard tools a standard name. On a Mazak mill, these would be called something like “E-MILL .25A” – write that name on the list. Print that list out and give it to all the programmers, set-up people and machinists working on these CNCs. See if anyone has any further feedback, and get agreement that this is going to be the standard list of tools that stay in each CNC all the time. Post it by each programming station so it is right at hand when making a program. In the real world, often you will find the list is always expanding and no one has the time to make the full complete list. But even just getting a short list done will start saving time immediately. Don’t worry about getting the list perfect, just get it started on the most common tools used. MazaCAM has a function to print out the list of tools used within a program. By using this function on a number of your programs, you can start seeing what tools you use over and over from job to job. MazaCAM offers a module that includes a way for you to enter all your tools into a database, and thus help you keep track of your tools, look them up and list them automatically on tool-sheets/set-up sheets, etc. Put ideas to test in the real world, not in the world of competing ideas. MazaCAM programs the Integrex, e-Machine, Nexus, Multiplex, Quick Turn and Super Quick Turn and the broad range of horizontal and vertical machining centers as well as all standard G-code CNCs.